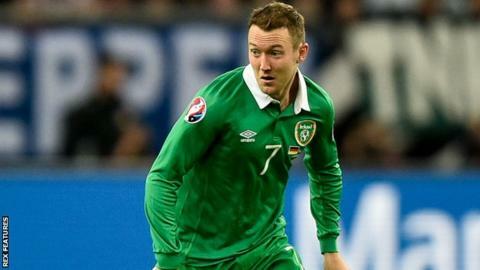 Championship side Sheffield Wednesday have signed Republic of Ireland winger Aiden McGeady on loan from Everton until the end of the season. The 29-year-old has made 43 appearances for the Toffees since joining from Spartak Moscow in January 2014, but has featured in only one game this season. McGeady began his career at Celtic, before joining Spartak in 2010. The Glasgow-born player has won 76 caps for the Republic, having made his debut in 2004. "He's a player that can improve the team and will help us in the second part of the season," boss Carlos Carvalhal told BBC Radio Sheffield. "It was good for him to play in different cultures, he understands different systems, different ways to play. "He has a big personal challenge because he wants to be in the European (Championship) with the national team. "He can play on the left, on the right, he can play also behind the striker. You want to bring these players to your team because they have quality." McGeady could make his Wednesday debut in Tuesday's home game against Burnley.